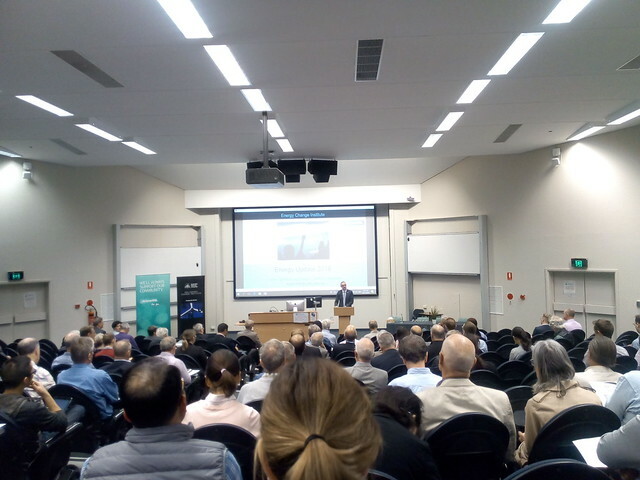 Greetings from the Australian National University in Canberra, where Andrew Barr, ACT Chief Minister is addressing the ANU Energy Update 2018. He mentioned that the ACT Government (the local government for Canberra), had worked with Reposit Power, to produce a virtual power station (claimed to the the world's largest). The Chief Minister also commented that one of Canberra's exports was policy, including energy policy. Professor Ken Baldwin, Director of the ANU Energy Change Institute, then gave the history as to how Australia ended up in the unusual situation of the government abandoning its has no effective energy policy, and the opposition adopting. He commented that while there had been a lack of government policy, industry had powered ahead.with renewable energy. He projected that renewable will take over from fossil fuel in Australia by 2024. At the current rate Australia will exceed its renewable energy target by 2020 and exceed emissions reduction targets. Even so, Professor Baldwin said that the certainty of policy was needed for this investment to continue, and for energy prices to be contained. Or as Jane Austen might have said: "It is a truth universally acknowledged, that a country in possession of a good energy demand, must be in want of a carbon price."